Pursuing a dream from childhood, when he picked blueberries in the fields of Hilyard Peck in Hopewell Hill, Stephen Holmstrom returned with his wife Elaine and son Christopher to live in the 200-year-old ancestral home which resides on 340 acres. Stephen is a 9th generation descendant of the Hopewell Pecks, who settled here in 1765, coming from Attleborough, Massachusetts. He is a descendant of Thomas Calhoun who married Rachel Peck, daughter of Abiel Peck, in 1768. In January 1989 the Holmstroms left Victoria BC, where they were both employed by the Provincial Government, and leaving behind four married children, Randy and Shelley in Victoria and Julie and Harley in Saskatoon, SK travelled across Canada in a rented van with all their possessions: their car on a trailer behind! The land is part of a 100,000 acre grant given to Thomas Calhoun by King George III in appreciation of services rendered during the French and Indian Wars. He was a trapper and a trader in the area now known as Canton, Ohio. During this period, he became acquainted with General Haldimand, Commander-in-Chief of the British Army in North America. These officers settled along the south bank of the Petitcodiac River, in what is now Albert County, New Brunswick. Abiel Peck, who also had holdings in what is now Sackville, crossed over the Bay and acquired 5,500 acres of the Calhoun grant. "Here lies interred the body of Abiel Peck, a native of Boston, and one of the first settlers of this place, who, on the 16th day of December, 1802, unfortunately perished in a boat, in the 73rd year of his age, leaving upwards of three-score descendants to lament his melancholy fate." Thomas Calhoun, with his brother-in-law, William Peck, mined grindstone from a little island in the Petitcodiac River called Grindstone Island. This was shipped to Baltimore by sloop via the river, the Bay of Fundy and up the East Coast to market. In the spring of 1772, the boat capsized while loading grindstone, and Thomas and William, along with other crew members were drowned. They are also buried in Pioneer Cemetery within view of Grindstone Island. 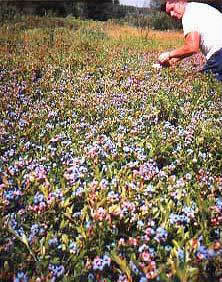 Many changes have taken place since 1989, land has been cleared, large vegetable and flower gardens have been planted. A heritage apple orchard has been started. 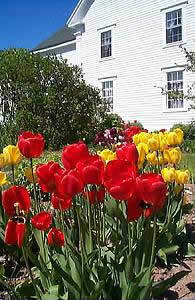 The home where Stephen was raised a mile away was built in 1770, another Peck home, and had one of the first nurseries in the province. 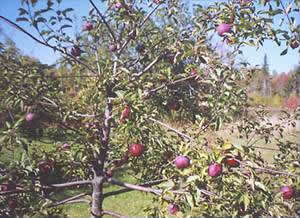 From the old orchard he has grafted many of the heritage apples as well as obtaining new stock. In 1991 Stephen and Elaine opened Peck Colonial House B&B, and have entertained people from all over the world, including many Peck and Calhoun descendants. In 1995 they began major restoration of some of the original house which had been torn down in the 1970's. They cut timber on the property and brought in a portable sawmill to make their own lumber, including 10x10 and 4x8 beams. They searched for old windows, doors, and moldings to incorporate into their addition to make it as authentic as possible. We welcome to our home everyone who enjoys a warm, comfortable atmosphere, good homemade food, and lots of interesting conversation.